Titanate (see Figure 1) or zirconate coupling agents form a less than 2-nanometer monomolecular layer on the surface of any organic/inorganic (see Figure 2). They chemically bridge non-silane reactive fillers such as CaCO3 (see Figures 3 and 4), carbon black – and silica, metal oxides, etc. with polymers (see Figure 5). For example, an organotitanate nano coating on carbon black acts as a metallocene-like catalyst on a polymer and lowers the Mooney viscosity, which results in increased flow and increased mechanical properties. Coupling agent liquid, powder and pellet forms; dosage; data and applications methodology in compounding and molding are discussed. Typically, when just 0.2 phr titanate is added into a thermoplastic polymer, molding cycle times are decreased on average by 20% as process temperatures are reduced 10%. For example, 0.6 phr of a pyrophosphato titanate on a 60 phr silica (HiSil 233) loaded sulfur cured EPDM compound will drop the Mooney viscosity from 70 to 53 while increasing the tensile strength 12%; 0.8 phr isostearoyl titanate on 80 phr silica (Silene D) filled Hypalon will reduce the Mooney from 56 to 36 and increase Scorch Time from 16 to 23 minutes; when 2 phr of a cumyl phenyl titanate is added to a 50 phr loaded SBR compound, the plasticizer level can be reduced from 10 phr to zero and have a 12% higher ultimate elongation; both 40% CaCO3 filled and unfilled PP compounds experienced respective reductions of 35.5% and 42% in injection mold cycle time and 22% and 11% in process temperature indicating a patented Repolymerization  catalysis as the primary mechanism; 17% pyrophosphato titanate coupled conductive carbon black in LDPE provides the same conductivity effect as 25% untreated CB. 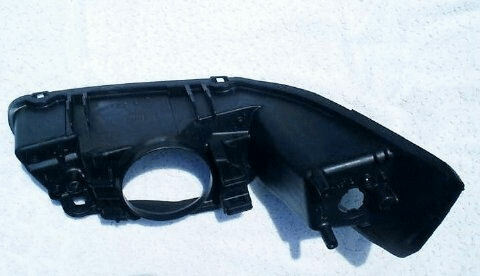 Parts can be molded – sometimes up to 40% faster at 10% lower temperature. Mooney Viscosity can be lowered by 20% or more while improving original and aged mechanical properties. Higher filler loadings of Carbon Black (see Fig. 6), CaCO3, ATH, Mg(OH)2 (see Fig. 7) and other flame retardants can be used and still process better while maintaining flexibility. Synergistic flame retardant effects are achieved via nanophosphorus intumescence. Plasticizer levels can be reduced without sacrificing elongation. Adhesion of polymers to aramids, polyamides, graphite and fiberglass reinforcements are increased significantly. Long term aged properties are maintained near original. Foam cell structure is made finer and more uniform independent of the type of blowing agent used (see Fig. 8). Sulfur bloom can be eliminated using rubber makers sulfur. Out gassing from moisture and entrapped air can be eliminated as hydrophobicity is increased. Incompletely molded parts and part rejects can be reduced greatly. Part surface smoothness, pigmentation and paintability can be enhanced. Exfoliate nanoparticulates in the water or organic phase (see Fig. 9). 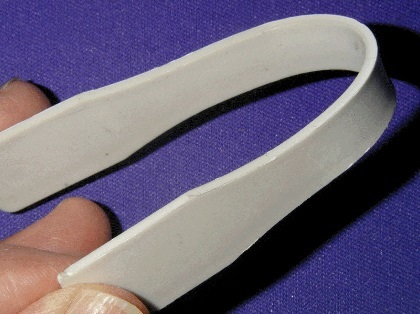 Denerve rubber with just 0.2 phr titanate (see Fig. 10) allowing the use of stronger higher molecular wgt. polymers having the processing characteristics of weaker low molecular wgt. analogs. Figure 1 – A typical (1 of 55 commercial) titanate structure– isopropyl tri[di(octyl)phosphato] titanate (KR® 12). Figure 2 – A nanometer atomic monolayer of titanate on an organic/inorganic filler/fiber – illustration. Figure 3 & 4 – Combined –CaCO3 Dispersion – Deagglomeration. Figure 5 – 0.5 wt. 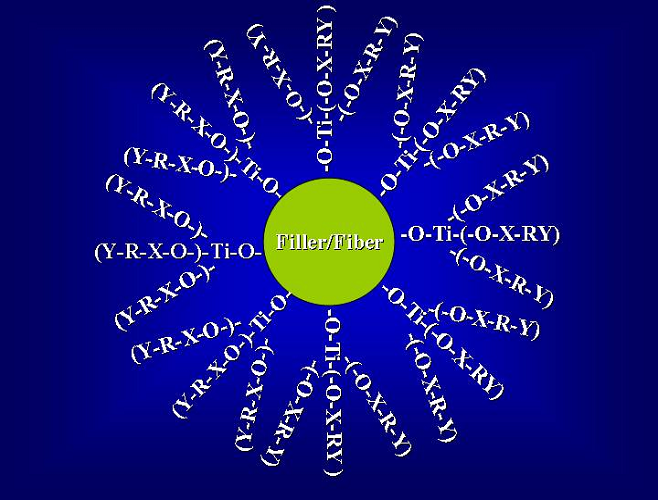 % KR TTS titanate flexibilizes 70% 3-micron CaCO3 filled polypropylene homopolymer. In 1973, the author invented an isopropoxy triisostearoyl titanate for dispersion of metal oxides and other inorganics used in rubber. This technology was first used to produce the zinc oxide bar masterbatch called Ken-Zinc for curing Neoprene (Chloroprene) rubber. Dispersion with titanate can be defined as the total deagglomeration or exfoliation of the insoluble inorganic or organic particulate to the attrited level of the particulate by the formation of atomic monolayers on the particulate’s interface resulting in the complete displacement of water and air voids by the organic binder phase to form a continuous inorganic/organic matrix. Processing and properties are facilitated when complete dispersion is achieved. The successful application of titanate coupling agents for better compounds depends upon understanding organometallic chemistry and physics and why it is different from silanes and other additives such as lubricants, lecithin, surfactants, metal stearates, impact modifiers, plasticizers, etc. Old mindsets based on prior art silane and other additive thinking can often cause misapplication of titanates and lead to missed opportunities for molders. Titanates “work” when correctly applied by their Six Functions as is attested to by several billion dollars worth of commercial finished goods using them in everything from cosmetics for beauty to propellants for smart bombs. There are over 355 ACS CAS abstracted “Works by S.J. Monte” in the literature and several are referenced [2-13]. There are 20 of the 55 commercial titanates and zirconates that are EINECS registered for use in the EU and are referred to necessarily by their type and alpha numeric code such as KR TTS or KR 12 due to their complex CAS chemical names (CN) and structures. (1) Coupling Function (RO)n = hydrolyzable group or substrate reactive group with surface hydroxyl or protons. Function (1) concerns itself with filler/fiber substrate reaction mechanisms, while functions (2) to (6) are polymer/curative reactive. Organosilanes have long been used to enhance the chemical bonding of a variety of thermoset resins with siliceous surfaces. However organosilanes are essentially non-functional as bonding agents when employing CaCO3, carbon black, boron nitride, graphite, aramid or other organic derived fibers. 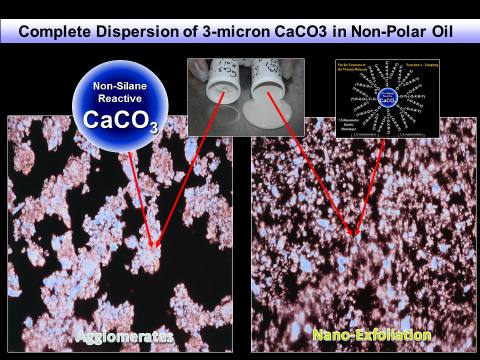 Plueddemann stated : “…Surfaces that showed little or no apparent response to silane coupling agents include calcium carbonate, graphite, and boron”. In its simplest terms, the titanate function (1) mechanism may be termed proton (H+) reactive via solvolysis (monoalkoxy) or coordination (neoalkoxy) without the need of water of condensation while the silane function (1) mechanism may be termed hydroxyl (OH–) reactive via a silanol-siloxane mechanism requiring water of condensation. Since almost all 3-dimensional particulates and species have surface protons, titanates are more universally reactive than silanes. Thus, carbonates, sulfur, sulfur donors, sulphates, nitrides, nitrates, carbon, boron, metal powders, azodicarbonamide, sodium bicarbonate and many other reinforcing or functional submicron or nano filler/particulate/fiber used in thermoplastics, thermosets and thermoset elastomers that do not have surface silane reactive hydroxyl groups will Ti couple. Figure 6 – 11% carbon black filled 20 M.I. LLDPE. 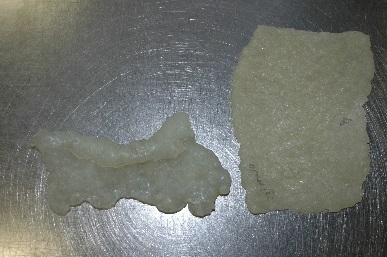 No titanate (left) and 0.75 wt. 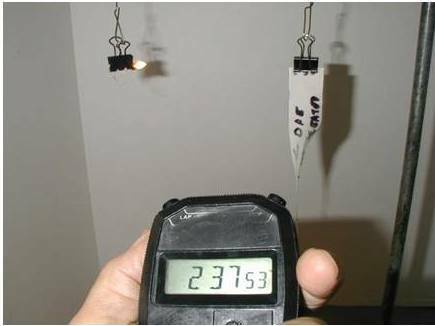 % pyrophosphato titanate (right). Figure 7 – 60% Mg(OH)2 filled 20 M.I. LLDPE. 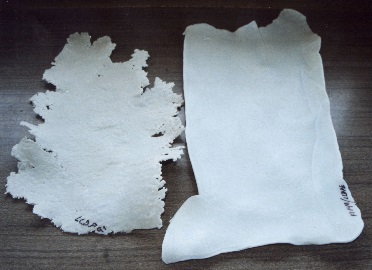 No titanate (left) and 0.7% pyrophosphato titanate (right). Figure 8 – NaHCO3 foamed SBR. 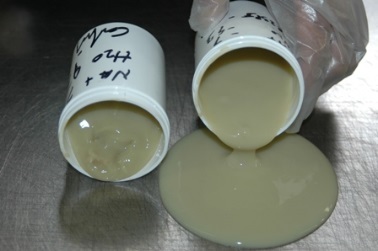 No titanate-15 phr (left) & 0.67 phr 75% active NaHCO3 paste masterbatch containing pyrophosphato titanate in an aromatic plasticizer (right). 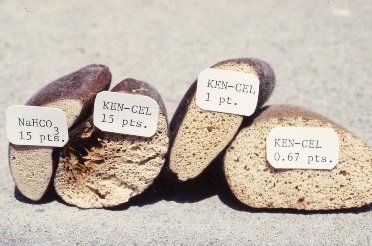 Figure 9– 7% Cloisite Na+ MMT Nano Clay in Water-96,000 cps (left). 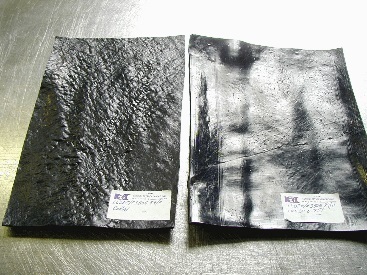 5% pyrophosphato titanate quat-1,400 cps (right). Figure 10 – Unfilled EPR off a 2-roll mill (left). EPR de-nerved with 0.3 phr phosphato titanate powder (right). “Coupling” (Function 1) creates a shift in the CPVC (Critical Pigment Concentration Point) of filled liquid and solid polymer thermoplastic and thermoset systems. A CPVC shift results in reduced resin demand and an exponential increase in functional pigment performance for conductance of: electrons, heat, cold, light and magnetic forces. The coupling of the titanate to the inorganic/organic substrate in 2-nanometer atomic monolayers allows for elimination of air voids, hydrophobicity, and a complete continuous phase for stress/strain transfer. The silane’s function 1 silanol-siloxane water of condensation mechanism limits its reactions to temperature environments below 100 ºC thereby eliminating the possibility of in situ reaction in the thermoplastic or elastomer melt above 100 ºC as is possible with subject titanates. (2) Catalysis Function (Ti, Zr) = tetravalent titanium, zirconium or non-catalytic silicon (Si). The Ti-O (or Zr-O) bond is capable of disassociation allowing transesterification, transalkylation and other catalysis mechanisms such as “Repolymerization” while the Si-C bond is more stable and thus unreactive. Organic titanates (and zirconates) are well known catalysts used in the manufacture of: polyolefins, polyesters, PBT, polyurethanes, polycarbonates, and polysiloxanes [1, 9, 15, 16]. The coordinate titanates are shown to improve the color and appearance during synthesis of the base polymer such as PET and PBT [17, 18]. Increased toughness (defined as the area under the plot of stress vs. strain) of the polymer due to increased elongation per unit length (strain) while maintaining or increasing tensile strength (stress). Finer, more uniform foamed polymers because titanate induced increased polymer strain strength prevents polymer bubble breakage at the elevated temperature where blow (gas release) occurs thereby reducing open cell formation, thus yielding lower SG. Repolymerization of the macromolecule in the melt allows regrind to be regenerated to virgin properties. Copolymerization in the melt improves the properties of polymer blends such as curbside recycled plastics. Reduced recrystallization time and increased polymer flow at lower temperatures resulting in faster extrusion, blow and injection mold cycle times and better quality parts as measured by strength, impact, aging, acid and salt spray resistance, appearance, weld line elimination and clearance tolerances. Aromatic (e.g. phenyl, naphthyl, styrenic) or aliphatic (e.g. ethyl, propyl, butyl) backbones which typically make up the thermoplastic macromolecule, liquid chemical compounds or thermoplastic elastomers are functions (2) to (4) reactive with titanate (or zirconate) independent of a function (5) curative reaction mechanisms. Thus, the monolayered, organometallic-coupled particulate and/or fiber become a catalyst support bed for single site, in-situ, metallocene-like “Repolymerization” catalysis of the surrounding polymer(s). (3) Hetero Atom Function (X) = Binder functional groups such as phosphato, pyrophosphato, sulfonyl, carboxyl, etc. impart intumescence, burn rate control, anticorrosion, quaternization sites, disassociation rate/electron transfer control, etc. The nanopyrophosphato titanium may act as a sole flame retardant at levels of 2 to 7% by weight of polymer or as a synergist on none-FR fillers. Fig. 11 shows vertical strip burn tests of compounds made with 44% 3-micron CaCO3 (treated without & with 3% pyrophosphato titanate) filled LLDPE. Figure 11 – 44% CaCO3/LLDPE Compound without pyrophosphato titanate burns to clip after 2 min. 37.53 sec. (left). 3% pyrophosphato titanate extinguishes burn. (4) Thermoplastic Function (R’) = thermoplastic functional groups such as: aliphatic and non-polar isopropyl, butyl, octyl, isostearoyl groups; naphthenic and mildly polar dodecylbenzyl groups; or aromatic benzyl, cumyl phenyl groups optimize bonding. (5) Thermoset Function (Y) = thermoset functional groups such as acryl, methacryl, mercapto, amino, etc. increase x-link network density. (6) 4-n = mono, di or tri-organofunctional hybrid titanates are possible, such as a titanate containing 1-mole of an aliphatic isostearoyl ligand (function 4) and 2-moles of acryl ligands (function 5). The physics of mixing is as important as the chemistry of coupling. Two principles govern the applications art of coupling agents: uniform distribution before the polymer melt phase for uniform coupling/catalysis and high specific energy input during the polymer melt phase for maximum shear/work energy for dispersion so that coupling at the filler interface and catalysis in the polymer interphase are made complete. 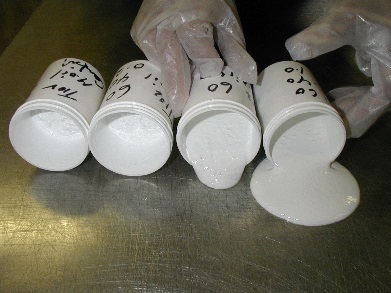 Often times, poor mixing methodology can defeat the best polymer-filler-reinforcement-additive compound design. Using the right titanate form as shown in Figure 12 is helpful. 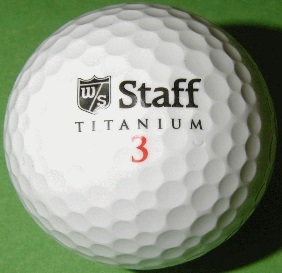 Figure 12-Titanate forms: 100% active liquid; 65% active powder; 20% active pellet. Optimum dosage is determined by the materials used in the compound and desired results and is usually between 0.2 to 0.7% by weight of the fillers or 0.2 to 0.6% by weight of the polymer. A 3-data point ladder study is useful (see Figure 13). Coupling agent selection is determined by the compound chemistry and the end effects desired. See References for coupling agent selection. 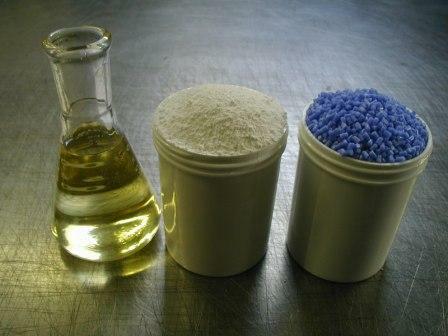 Figure 13 – 60% TiO2/mineral oil. No titanate (left); 0.25% (left-center); 0.5% (right-center); 1.0% (right). We have demonstrated herein through figures and references some results obtained with titanates & zirconates in thermoplastic & elastomer compounds (see Fig. 14 & Fig. 15, typical). Claims made herein are based on over three decades of experience in the laboratory and in the field – and documentation by other investigators in almost 2000 patents and technical papers. Figure 15 – The 40% FG/Nylon automotive part shown had a 7-second reduction in cycle time and lowered process temperatures (ºC) by 11% (rear zone: 282-249; zone 1: 304-254; zone 2: 304-227; nozzle: 310-260) using 1% of a 20% active amino titanate pellet masterbatch dispersed in EVA. Monte, S.J., Sugerman, G., Kenrich Petrochemicals, Inc., “Repolymerization”, U.S. Patent 4,657,988, April 14, 1987. Monte, S.J., Kenrich Petrochemicals, Inc., “Ken-React Reference Manual – Titanate, Zirconate and Aluminate Coupling Agents”, 3rd Rev. Edition, March 1995, 340 pgs..
 Monte, S.J. & Sugerman, G., Kenrich Petrochem., Inc.: S.M. Gabayson & W.E. Chitwood, General Dynamics, “Enhanced Bonding of Fiber Reinforcements to Thermoset Resins”, 33rd Int’l SAMPE Symposium, Anaheim, CA, March 7-10, 1988. Monte, S.J. & Sugerman, G., “Alkoxy Titanates & Zirconates as Corrosion Inhibitors in Clear Coats and Unfilled Polymers”, Corrosion/88, NACE, St. Louis, MO, March 21-25, 1988. Monte, S.J. &Sugerman, G., “The Usage of Organometallic Reagents as Catalysts and Adhesion Promoters in Reinforced Composites”, 2nd Int’l Conf. on Composite Interfaces (ICCI-II), Case Western Reserve U., Cleveland, Ohio, June 13-17, 1988. Monte, S.J. & Sugerman, G., KPI; A. Damusis & P. Patel, Polymer Instit., U. of Detroit, “Application of Titanate Coupling Agent in Mineral and Glass Fiber Filled RIM Urethane Systems”, SPI Urethane Div. 26th Annual Tech. Conf., Nov,1981. Monte, S.J. and Sugerman, G., KPI, “Titanate Coupling Agents – 1985 Urethane Applications”, SPI Urethane Division 29th Annual Technical / Marketing Conference, October 1985. Monte, S.J. “Injection Molding with Neoalkoxy Titanates and Zirconates”, SPE RETEC, White Haven, PA, Oct.19, 1995. Monte, S.J., “Titanium and Zirconium Esters vs. Couplers & Single Site Catalysts for In-Situ Repolymerization & Copoly-merization Useful for Recycled Polymeric Compositions”, ACS Rubber Div., Louisville, KY, Oct. 8-11, 1996, Paper No. 57. Monte, S.J., “Better Bonding and Metallocene-like Catalysis Benefits for Elastomers”, Rubber Technology In’l ’96, UK & Int’l Press, a Div. of Auto Intermediates Ltd (1996). Glaysher, W.A., Haff, D.R., Schlaubitz, H.H., and Monte, S. J., “The Use of Organometallic Coupling Agents as Process Aids in Blow Molded HDPE” SPE RETEC, High Performance Blow Molding Conference, Oct. 9-10, 1990. Monte, S.J., “More Efficient Manufacture of Better Foamed, Filled and Unfilled Polymer Compounds With Titanate and Zirconate Coupling Agents”, Northeast Regional Rubber & Plastics Exposition, September 21-22, 1994, Mahwah, NJ. Monte, S. – Chapter 5 – Titanates – “Functional Fillers for Plastics”, edited by Xanthos, M., Wiley-VCH Verlag GmbH & Co. KGaA, 2005, ISBN 3-527-31054-1. Plueddemann, Edwin P., “Silane Coupling Agents”, Pg. 114, 1982 Plenum Press. Field, R. and Cowe, P.L., “The Organic Chemistry of Titanium”, Butterworth & Co., Washington, D.C., 1965. Korea Institute of Science and Technology, U.S. 5,237,042, Aug. 17, 1993. Kim, C.Y., Cho, H.N., Yoo, H.W., Kim, H.J., K.I.S.T., “Method for the Preparation of Polyester by Use of Composite Catalyst”, U.S. 5,714,570 dated Feb. 3, 1998. JP 57,121,030 – Kao Soap Co.